I have no idea what this means. There is a broad white line painted on Hardwick Road. 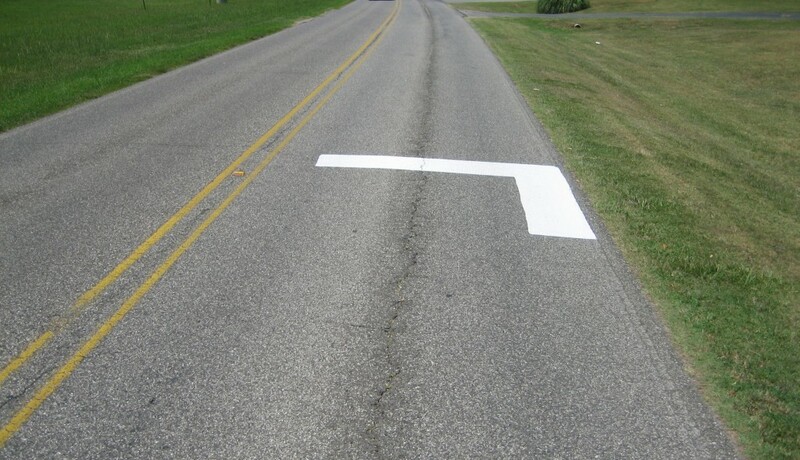 It is real road paint too, not some latex house paint used for a practical joke. It is inside city limits and not at a rail crossing, a street crossing or a school zone. There is a church two lots up on the right. If anybody knows this one I would be interested to find out. Sorry I missed wishing you all a happy 4th of July. I was out on the road again. Oh, I know this. It means "absolutely no photography". It's another form of a crop circle. The aliens are just using letters from the alphabet, since they can't really make intricate patterns without the wheat field. Oh no, tore. I hope you don't have these in Japan. parking for a very long truck. Is it next to a fire hydrant? If so, it's probably marking its location. Paint test strips for future lines.